A reader in Claverack forwarded the news that (as predicted here last week) the rough patch in the proposed Lafarge/Holcim merger has proved to be more of a speed bump than a roadblock. Holcim’s posturing has indeed led to Lafarge making some concessions and the merger is said to be moving forward again. More at this link. Via fabled River activist Bob Boyle: Prompted by a vast uptick in rail and barge transportation of fossil fuels along the Hudson River, the 625,000-member Center for Biological Diversity put the Coast Guard and EPA on notice today of its plans to sue if steps are not taken to address the risks posed. The group warns of potential harm to “millions of people” in the region due to spill plans which have been rendered “inadequate” by the huge increase in fuels running south down the River—as well as major new storage capacity at sites like the Port of Albany, which handled an estimated “one billion gallons of Bakken crude oil alone” in the past year. “Given the unprecedented increase in rail and barge transport of oil through the planning area, and given the new products and wastes being transported, impacts to species hold far greater risk than was the case just a few years ago,” the Center writes in its memo to the Federal agencies. Much of that increase comes from tracking and tar sands extraction in the Dakotas and Canada, fuel sources which the Center says pose even bigger risks to the fish, birds, mammals plants and habitats in and around the river than ordinary crude oil due to differing densities and properties which could make cleanup all the more difficult. The Center further notes that “until formal consultation is complete … harm to any listed species resulting from spill response activities could subject government employees or private workers to substantial civil and even criminal penalties” in the event of a disaster. Olana has recently published Art Meets Art: Perspectives On and Beyond Olana, a collection of essays and images about the famous Church landscape. I was asked to contribute the following short piece about The Olana Partnership’s role in the nearly seven-year “stop the plant” battle against St. Lawrence Cement; my text appears below. The new publication is available at the historic site’s bookshop, and also includes texts supplied by poet John Ashbery and TOP president Sara Griffen. “We are very concerned about the visual impacts on the Olana viewshed, and also about acid deposition from the plant's air emissions endangering its historic structures.” So said Margaret Davidson before an anxious throng of 1,000 attendees who packed a sweltering gymnasium on the campus of Columbia-Greene Community College on June 21st, 2001. That day marked the first major public hearing about the St. Lawrence Cement proposal for Hudson and Greenport. With Administrative Law Judge Helene Goldberger presiding, the hearing ran from 10 am until nearly 1 am the next day. The proceedings were punctuated by thunderstorms, both actual and metaphorical. The comments of Davidson, like those of TOP president Sara Griffen and countless other Olana supporters, were prompted by a Swiss-owned company’s vast, coal-fired project, which centered around a forty-story smokestack and 1,400-acre mine, along with a sprawling waterfront barge facility. Citizen after citizen stepped forward to denounce the proposal, with Frederic Church’s home a constant theme of longtime Olana boosters such as Arthur Baker, Peter Jung, Ruth Piwonka, and many others. A key principle established during the nearly 7-year struggle was that this “250-acre landscape at the Center of the World” was intended to be experienced as a whole. Staff and experts argued successfully that Olana consists of much more than just its famous southwestern Hudson River view. After SLC claimed that Church never depicted the area where the main facility would be sited, Hudson resident Don Christensen identified sketches of Becraft Ridge in the Olana archives, proving the company wrong. Davidson further noted that “the Olana Partnership is concerned that the plant and its plume would be a focal point in the viewshed on both the ridge road, the carriage trail closest to the house, and from Cozy Cottage, Church’s original family house,” which was only then beginning to be restored. Like its two main allies in the fight, Friends of Hudson and the Hudson Valley Preservation Coalition, Olana likewise argued that there was a strong economic argument to be made against the plant. While the project would not create new jobs, due to the transfer of workers from another facility, it would have caused great harm to other economic engines in the area. But has the Board of Supervisors already buried its own advisors’ recommendations? At least one positive change might come of the disaster last summer at TCI of NY, whose PCB-handling facility burned to the ground almost one year ago... That is, if the Columbia County Board of Supervisors heeds the advice of its Environmental Management Council (EMC), rather than suppressing its recommendations. 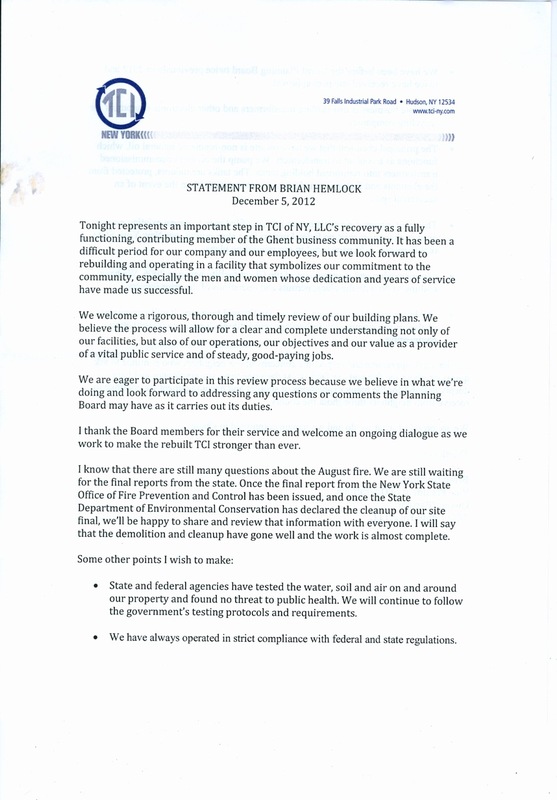 Finding that TCI’s operators “showed disregard for the safety of plant workers, the community, and the environment,” the EMC issued a stiff memorandum to the Supervisors back on June 24th. Drawing lessons from the TCI incident, the memo recommends “strategies that Columbia County and municipalities could adopt to avert the recurrence of such an event,” including tough new rules for the management of hazardous waste in the entire County. However, over a month later, the Board of Supervisors still has not made the recommendations public. This site now has obtained a copy of the letter, authored by chair Ed Simonsen, and apparently recommeneded unanimously by EMC members, and it can be downloaded as a PDF via this link. Any proposed project which would produce or handle toxic or potentially toxic substances should be subjected to a rigorous SEQRA process. Detailed plans showing all processes and operations along with their approved methodologies should be reviewed by an independent environmental consulting firm and the results of the analysis reported to the reviewing board. Plans should also include the identification of safe handling and storage practices of all appurtenant chemicals used at the site. Towns abutting this use should be designated as interested parties. Regardless of location there should be a referral to the County Departments of Health, Safety, and the County Planning Board. Conditions of approval should include provisions for unannounced inspection of the facility by a qualified and or licensed chemical engineer. Assuming a local oversight plan, persons providing this service should be required to have the requisite education, license or experience to adequately assess those substances and procedures being used/carried out at the site. These should be augmented by NYSDEC and USEPA inspections. The cost of each inspection would be the responsibility of the plant operators in perpetuity. An escrow account funded by the business operator/owner to fund inspections should be created. Costs borne by local fire and rescue squads/ companies to equip themselves and train to address accidents at the site should be paid for by applicant/plant operator. Comprehensive, detailed records should be retained by the municipality and contain all board reviews and conditions of approval or rejection. If a project is approved by the community’s designated reviewing board, monthly reports should be required to be made by the owner/plant operator to the town board or its designee and should be available to the for the public to read, These reports would itemize and describe in detail and quantify all materials entering and leaving the plant. This would include all materials in trailers or other mobile devices. Copies would be forwarded to the local Fire Company and Town Board. The project operators shall also maintain off site material records which are held by an independent party. Consideration should follow a risk analysis to determine benefits and potential detriments of a proposal which deals with hazardous substances. Communities may wish to exclude or deem incompatible some uses. Short of prohibiting a given use, the community should establish a “Zone of Vulnerability” which delineates minimum separation distances to schools, nursing homes, hospitals, or heavily populated areas. The plant operators/owners shall not be permitted to sub-lease or sub-contract any portion or use of the site to any other entity without review and approval granting a special use permit. Proper permits should be obtained and maintained with NYSDEC, USEPA, and OSHA. A chain of custody for all chemicals and toxic substances entering and leaving the premises should be available to authorities upon request. Methods of pursuing that mission include “research, recommendations, reports, plans, inventories, and public information and education,” thus placing the current memorandum well within its apparent powers and goals. According to the memo, the EMC based its review upon “available reports,” in particular the February 2013 findings of the New York State Office of Fire Prevention and Control. In an interim settlement of a specious lawsuit brought by TCI of NY, the Town of Ghent has agreed to give PCB (mis-) handler six months to find a new town to bedevil. According to an attendee of yesterday’s hearing before judge Jonathan Nichols, TCI and Ghent have signed a “tolling agreement” which suspends the lawsuit. TCI had claimed in court filings that the Town’s attorney had a conflict of interest, and had asked Nichols to prevent Ghent from enforcing its Zoning code. Assuming TCI finds a new home in one of three other towns they have approached, including Coeymans, the company will void its application to rebuild in Ghent, and the Town will hold TCI harmless for its actions. (Good riddance to bad rubbish?) The Albany Times-Union has previously reported that the company also has scoped out sites in Saratoga, Washington and Rensselaer counties. The company also will pay $12,500 to cover Ghent’s expenses thus far related to the now-aborted reviews. If TCI has not found a new home by the start of 2014, it could in theory reinstate its legal objections, and resume its quixotic pursuit of fresh permits from Ghent, and would presumably have to contribute an additional retainer for that review. More likely, one suspects, is that the two parties would extend the tolling agreement for another 3-6 months to give TCI more time to skip town. This leaves a strong appearance that TCI is afraid that Town officials might be contacted by other municipalities to which the company has applied for asylum, and that the neighboring officials might hear details of their time in Ghent. Considering that Ghent now seems eager to have this thorn in their side removed, it’s hard to imagine that it would do so. If anything, the clause seems as likely as anything to backfire. Just imagine someone from, say, the Coeymans Planning Board (which has already called TCI on the carpet) phones a Ghent official seeking advice. But Coeymans is told by Ghent told that it is under a gag order not to talk about TCI’s operations. Wouldn’t that set off as many alarm bells with the person calling as anything the official might tell them? In any case, with TCI’s two 2012 fires extensively covered in the T-U, New York Times, YouTube, and various local news outlets, any potential new host doing even cursory research would probably stumble upon reports of the company’s past troubles. Wherever TCI lands, they are likely to face far more scrutiny and oversight than they have had to endure over the past three decades in Columbia County. 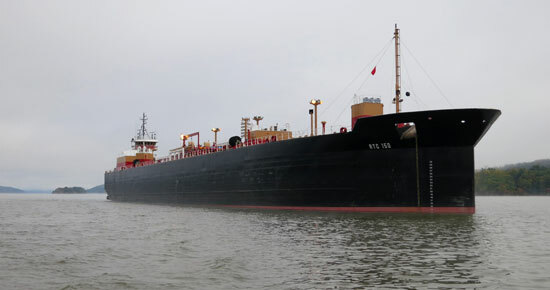 Billing itself as “environmentally friendly” (mainly on the basis that barges are less polluting than trucks), the 12-year-old port is roughly 10 miles south of Albany, and directly across the Hudson River from Schodack Landing. As the aerial photograph shows, the Port is also near the Thruway, and located not far from some densely-populated neighborhoods. And it’s barely a half-mile from the Lafarge cement plant in Ravena. The company told the T-U that they are operating “on a temporary basis in Coeymans while we continue to evaluate our long-term opportunities. A permanent facility in the Port of Coeymans is among the opportunities we are considering, and we have submitted a site plan to the Coeymans Planning Board for its review.” They refused, however, to explain how their operation would compare to their now-scorched Ghent business. The article lists other sites still on the company’s radar in counties including Saratoga, Washington and Rensselaer (including East Greenbush , Rensselaer and Schodack), and states that returning to Ghent is still a possibility. Prior to the Ghent fire, accidents at TCI included a worker’s onsite death from freon exposure; a failed incenerator proposal; a transformer explosion at their temporary home in Greenport; and another major fire at their Newburgh plant. At one point between their stints in Newburgh and Greenport, the company tried to move to Athens, but opposition from firefighters and residents squelched that plan. The Coeymans Planning Board meets next on July 1st at 7 pm at 18 Russell Avenue, according to the Town’s website. ... and turns up some startling information, at this link. Imagine if someone came into your home and said, “Hey—nice TV. I’ll let you have it if I can hang out, watch hockey and raid your fridge for the next 50 years.” Most people would tell that person to take a hike. Yet it appears that’s exactly what Holcim may be doing in this latest Hudson Waterfront mess. Not mentioned so far during the debate about TCI’s two fires (and desire to remain) in Ghent isthe company’s brief stay in the Town of Greenport during the late 1980s, after being kicked out of Ulster County. And, as happened before with its mismanagement in Newburgh and later in Ghent, TCI’s Greenport activities resulted in a major explosion. A front-page article in the June 22nd, 1987 edition of The Register-Star reported that a transformer blast that day “rocked an area within a half-mile” of TCI’s facility on the Industrial Tract. The explosion was audible at the Greenport town hall, according to Greenport Officer-in-Charge John Hawks... Greenport firemen were called to the scene [along with] Columbia County Sheriff Paul Proper and Undersheriff James Bertram. EnCon officials were expected to arrive on the scene later this morning. Some transformers contain levels of PCBs. It was unknown this morning whether the explosion caused any leakage of the suspected carcinogens. A search of seven months of the Register’s back issues found no follow-up report on the cause of the blast or investigation of environmental fallout. By 1988, TCI was reëstablished on Falls Industrial Road in Ghent, the blast apparently not having given that Town’s planning board any cause for concern. In March 1989, a young TCI worker (also named Smith, but no known relation) died after being overcome by fumes at TCI’s new plant. The search for this article was prompted by a brief mention in a 1989 report on the fatality, alluding to the earlier Greenport explosion, spotted by Patti Matheney of GhentCANN. Why this earlier explosion has never come up is anyone’s guess. Perhaps the barrage of major news of 1987—the Wiley Gates trial, a massive October snowstorm, the televised testimony of Philmont native Ollie North, the death of Jackie Gleason?—somehow blotted this event from local memory. Thanks to the vigilance of Riverkeeper—which filed a complaint about the facility at Cementon across the river from Germantown—Glens Falls Lehigh Cement has been fined $50,000 by the State for allowing leachate to seep into the Hudson River. The Kingston Daily Freeman reports, however, that the NYS Department of Environmental Conservation will forgive 20% of the fine if Lehigh takes steps to correct the problem within three years. Riverkeeper’s complaint goes all the way back to 2007. The Lehigh plant no longer manufactures cement from scratch, but rather blends portland cement produced elsewhere with imported slag, a waste from the iron industry. Residents banding together under the rubric of the Germantown Neighbors Association have challenged the facility’s permitting and management over the past decade. The inimitable, irreplaceable, and indispensible Bob Boyle gives testimony on fracking in Albany in the video above, taking the New York State DEC to task as only he can. At last night’s meeting of the Ghent Planning Board, it emerged that TCI of NY is behind in payments to the Town of Ghent to cover engineering expenses related to cleanup of its Falls Industrial Road site, according to firsthand reports from attendees. And until such payments are brought up to date, and until the company also puts $10,000 more in escrow for review, the Ghent planners do not intend to take up an application from the company to rebuild and resume operations. TCI’s Brian Hemlock arrived with his attorney, Bill Better, as well as an engineer from Crawford & Associates and a representative of architect Dennis Wedlick, in an attempt to present an application—but ran into the stumbling block of past due bills and future escrow requirements. The application materials were dropped off, but not considered. However, that 2012 application indicated TCI’s plans “to store and consolidate regulated PCB wastes,” preparing them “for shipment to EPA approved and alternate disposition facilities,” an apparent contradiction. Hemlock also circulated a heavily-massaged p.r. statement [ page 1 | page 2 ]. TCI worked with a public relations firm, Blass Communications, in the wake of August’s catastrophic inferno—its second fire of 2012—but it isn’t clear if they are still in the picture. Lastly, Matheney writes that Planning Board chairman “Jonathan Walters asked the Board to "do their homework" over the next month and come back to the Jan. meeting with questions for TCI. Audio of the meeting recorded by another resident is expected to be posted online later today. Seeking to signficantly expand its operations, TCI of NY quietly filed hundreds of pages of applications in the past year with State and Federal authorities—without ever applying to agencies of the Town of Ghent to comply with local zoning. 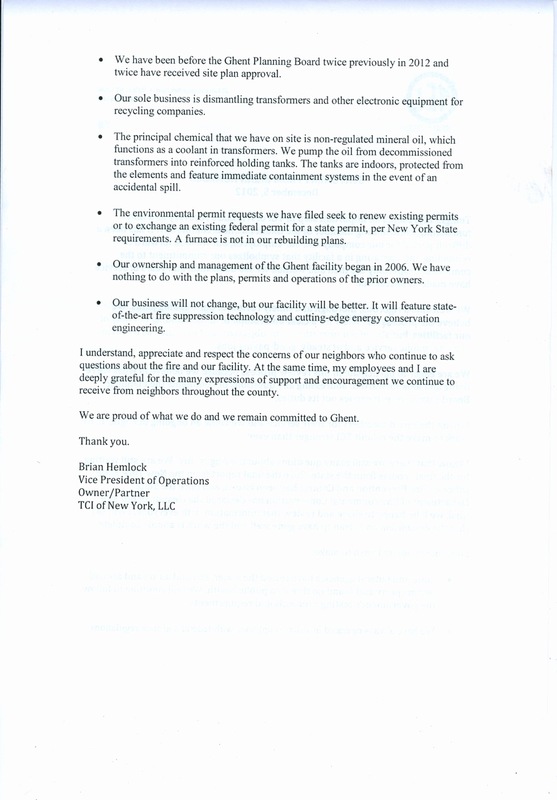 Buried in a 440-page document, revelations of these planned changes by TCI in the year before their catastrophic August fire emerged after a long wait for a response to a Freedom of Information Law request to the New York State Department of Environmental Conservation. DEC finally coughed up the 440-page document three months after this site placed multiple reminder calls and emails. (FOIL requests are normally dealt with within 5-to-20 days.) The State application, which includes materials submitted to the U.S. Environmental Protection Agency, was finally produced only once this site notified the DEC public relations office that a press release detailing the agency’s non-responsiveness was in the works. • Storing 40,000 pounds of PCB transformers. Minutes of the Ghent Planning Board do not indicate that such major changes to the TCI facility were ever brought before them for review and approval. A request by one member to review any DEC permitting was noted in the minutes, but the request was “withdrawn” f0llowing these assurances by TCI as well as from the Planning Board Chair that everything was in order. Legally, an applicant must seek permission from local authorities for activities covered by local zoning codes, even if they are permitted by other agencies. Indeed, that is just what scuttled TCI’s attempt to build a PCB incinerator in Ghent in the late 1980s; even though NYS DEC casually greenlighted the project, the Town (and neighbors) objected and stopped it from happening based on local rules. Moreover, under the Ghent Zoning Code new activities and changes in use must be brought before the appropriate board(s) when their scope exceeds their original permit, and/or when changes are proposed after the date of changes to the Code. The 440-page application submitted to the State and Feds also includes many eyebrow-raising statements. For example, a review of working conditions and worker qualifications concedes that while some employees would be working with materials such as explosives and toxic chemicals, it then goes on to say that these workers will not need any prior experience or training. A young employee died at TCI after exposure to freon gas in 1989. A copy of the 440-page application (which is a very large file) is available upon request via email.